It's good that Sons of Anarchy has pointed itself more clearly in the direction of an end game, as narrative wheel-spinning doesn't serve the show well. 656 min. FX. Directors: Paris Barclay, Guy Ferland, Peter Weller, Kurt Sutter, Gwyneth Horder-Payton, Paul Maibaum, Billy Gierhart. Cast: Charlie Hunnam, Katey Sagal, Mark Boone Junior, Ron Perlman, Maggie Siff, Dayton Callie, Kim Coates, Tommy Flanagan, Theo Rossi, Ryan Hurst, William Lucking, Ray McKinnon, Rockmond Dunbar, Danny Trejo, Kenny Johnson, Benito Martinez, Tom Arnold, Marianne Jean-Baptiste. Sons of Anarchy creator comments, on the latest home-video release of the show, that he sees Season Four as "the end of Act II." I would argue it comes closer to "the end of Act III," at least as the show corresponds to Hamlet. For the uninitiated: Sons of Anarchy takes inspiration from Hamlet, transplanting the basic story into the world of outlaw motorcycle gangs. "SAMCRO," or the "Sons of Anarchy Motorcycle Club - Redwood Original," was once led by John Teller, whose son "Jax" (Charlie Hunnam) now serves as club VP under usurper Clay Morrow (Ron Perlman); Clay has also taken as his "old lady" Jax's mother Gemma (Katey Sagal). Add to "Prince Hamlet," "Claudius," and "Gertrude" characters that serve functions similar to Ophelia (Maggie Siff's Tara), Horatio (Ryan Hurst's "Opie"), and Polonius (William Lucking's "Piney"), and you start to get the idea. In Season Four, Jax will be pushed to consider avenging his father (who continues, ghost-like, to haunt his son—now through letters he's left behind), Tara will have a "mad scene" or two, and—well, to say more would be too much of a spoiler. The crime drama of the fourth season largely concerns Clay's dubious decision to get into bed with the Galindo drug cartel. The drug business promises a tremendous infusion of cash, but also buys the club trouble while most of the club is under scrutiny following a fourteen-month prison stint. Meanwhile, Assistant U.S. Attorney Lincoln "Linc" Potter (Ray McKinnon) pursues a RICO case against the club, partly by roping in Charming, California's new top cop: Lieutenant Eli Roosevelt (Rockmond Dunbar) of the San Joaquin Sheriffs' Department. As trouble compounds and long-buried secrets rise to the surface, SAMCRO becomes riven by internal strife that comes to threaten Clay's authority. At this stage in the show's history, Sons of Anarchy resembles The Shield as much as Hamlet. While long-term end games play out, each week's episode involves short-term problems to be solved, such as a gang theft of one of SAMCRO's gun shipments. Both shows share a knack for kinetic, upsetting violence, not to mention several actors, writers and directors. Season Four tightens the show's focus after a less-than-taut season that split time between Charming and Belfast, and the cartel storyline allows for a distinctive recurring player in Danny Trejo (as Romero "Romeo" Parada); other guest stars include Marianne Jean-Baptiste and returning players Tom Arnold, David Hasselhoff and Drea DeMatteo. Familiarity certainly hasn't bred contempt, but it's good that Sons of Anarchy has pointed itself more clearly in the direction of an end game, as narrative wheel-spinning doesn't serve the show well. This solid season benefits from McKinnon's quirky antagonist, who makes hell for one of the club members in a tense "undercover" storyline, but it also makes important strides in forcing issues between the core characters. With this show, something is always rotten in the state of California, and it's usually a corpse; the body count will continue to pile up when Season Five debuts on FX this fall. Showing comforting consistency, Fox packages another value-added season set in Sons of Anarchy: Season Four on Blu-ray. The transfers look as sharp as ever, though the digital image shows a bit of weakness in low-light scenes that compromise black level and wash out shadow detail. That quibble aside (and it's one no doubt endemic to the source material), these are handsome transfers distinguished by their crystal clarity and true color. The lossless DTS-HD Master Audio 5.1 surround mixes are truly terrific, with LFE showcased by those revving engines and frequent gunplay (there's some pretty heavy artillery employed this year); dialogue is always nicely prioritized, and the source-music montages always come with impressive dynamic range. 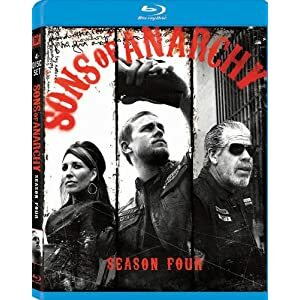 The set includes thoroughly enjoyable and informative audio commentaries on "Out" with Kurt Sutter, Paris Barclay, Charlie Hunnam, and Ron Perlman; "Hands" with director Peter Weller; "Hands" with Sutter, Katey Sagal, and Maggie Siff; and both parts of the finale "To Be," with Sutter, Hunnam, Perlman, Mark Boone Jr., Dayton Callie, Theo Rossi, Kim Coates, Tommy Flanagan, and Ryan Hurst. The Sons of Anarchy App Integration infuses your iPhone or iPad with a tour of the S.O.A. clubhouse, alternate scenes, storyboards, character bios, and e-shopping for SOA products. Each disc includes a selection of "Deleted Scenes" (12:34, 7:53, and 3:22, HD), and we get the Season Four "Gag Reel" (2:44, HD). "Farewell ---------" (7:10, HD) sends off a beloved character and actor (spoiler obscured), with comments from the actor in question, Sutter, and the rest of the cast, who provide testimonials. "Fans of Anarchy" (4:47, HD) gives us a glimpse of a special episode screening and Q&A to which two super-fans were invited; we hear from Sutter and the fans, as well as some cast members on the panel. "Anarchy at House of Blues" (10:20, HD) contextualizes and provides footage from a benefit event at the House of Blues, where friends of the show performed to raise money for the family of a deceased man. Katey Sagal performs Leonard Cohen's "Bird on a Wire," and Curtis Stigers and The Forest Rangers performs theme song "This Life." All site content © 2000-2019 Peter Canavese. Page generated at 04/19/2019 02:01:44AM.